As electronics become increasingly used in home bathrooms and kitchens, plumbers may find themselves facing different queries from customers. In addition to the usual leaking pipes, poor drainage, etc., in today’s rapidly approaching era of the ‘connected home,’ they may get calls like “my shower is not communicating” or “my interactive mirror is not talking to me.” It will pay to be up to date on this technology. Connected home technology means simply that the controls of different appliances in the home communicate with each other via ‘smart’ technology. Different manufacturers are at different stages with this technology, but it is coming rapidly. Behind the wall, Moen’s digital shower valve with plumbing for the shower and four body sprays. “What we’re finding is that technology is expanding into all areas of the home for the consumer,” remarked Garry Scott, vice president of marketing and E-commerce for Moen Canada, Oakville, Ont. It will only be a short matter of time until the Wi-fi connected smart shower control knows that first thing in the morning four people in a home are going to take showers, so perhaps an hour before it might ramp up the water heater, also Wi-Fi enabled, to ensure there is enough hot water. 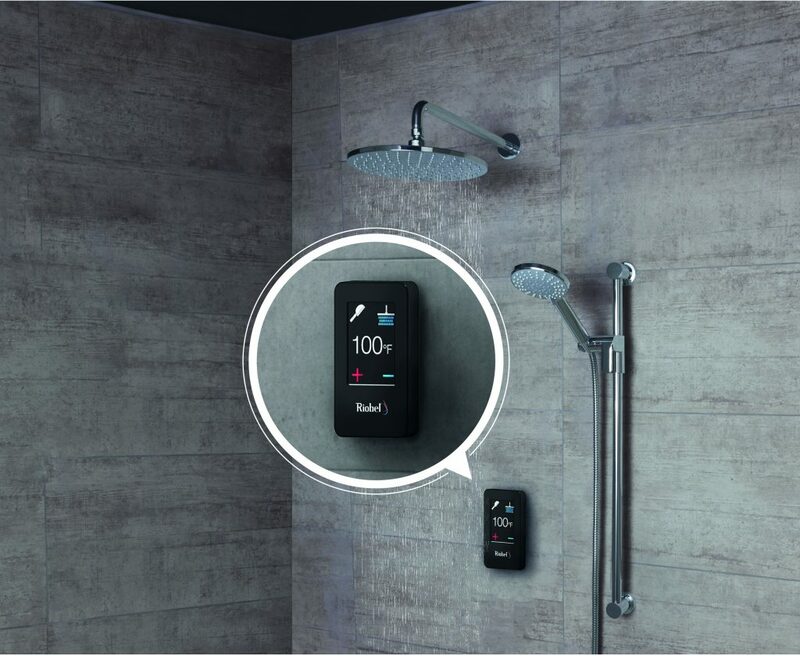 Touch activated shower controls are becoming common and at least two manufacturers have introduced Wi-Fi enabled shower controls, voice-activated with Amazon Alexa technology. 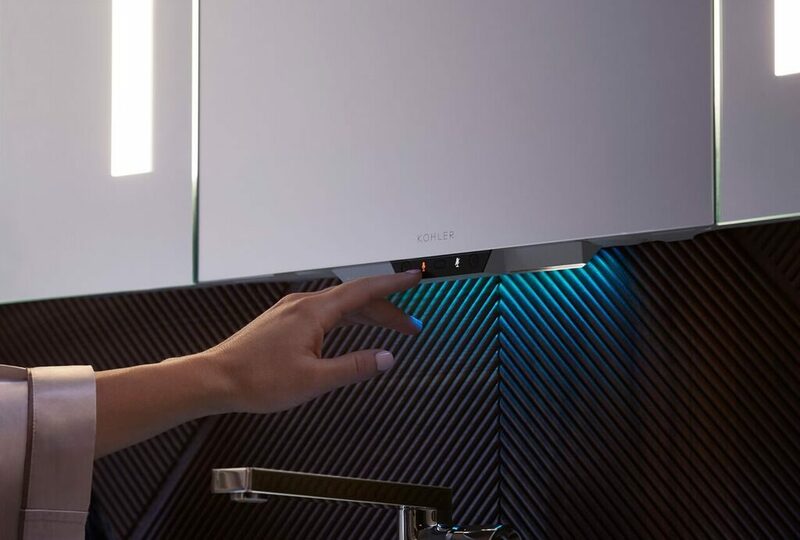 “As ‘connected’ devices become increasingly common in our homes, this offers significant opportunities for further advancements,” remarked Nicole Allis, marketing manager for Kohler in Kohler, Wisconsin. Each user programs in their shower settings with Amazon Alexa on their smartphone. It should be noted that home electronics are quite different from those used in commercial applications. Residential equipment is designed primarily for the comfort and convenience of the home’s occupants rather than for water conservation, although that is a by-product. The homeowner can turn on the shower and let it warm up from the comfort of their bed with the U by Moen system. Introduced this year, the U by Moen shower features a digital shower valve that offers precise thermostatic control and can control up to four shower devices at a time – a shower head, body sprays, etc. The digital shower valve is hard wired to an electronic Wi-fi-enabled wall controller, which can be mounted virtually anywhere, up to 30 feet away. There is no cartridge in the shower valve and there are no traditional valves on the shower wall. 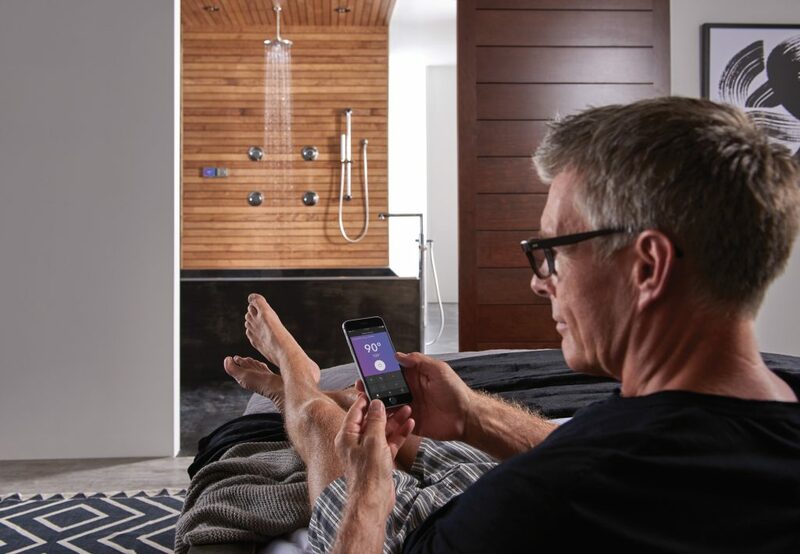 Each family member can program in their favoured shower settings – well, up to 12 in the U by Moen smart phone app and two on the shower control itself. The user can also program it and turn it on with their smart phone. This year Moen has taken it one step further, introducing voice activation with Amazon Alexa and, later this year, expects to have the same feature with Apple HomeKit. The user can now turn on the shower from the comfort of their bed or anywhere else with voice activation. And when the shower is up to temperature, it sends the user a note on their smart phone to let them know it’s ready. In a YouTube video about the Kohler Konnect system, a young man puts a glass under a faucet and says, “pour eight ounces.” It does. A woman looks at a mirror and says, ‘turn lights on maximum.’ The lights brighten. 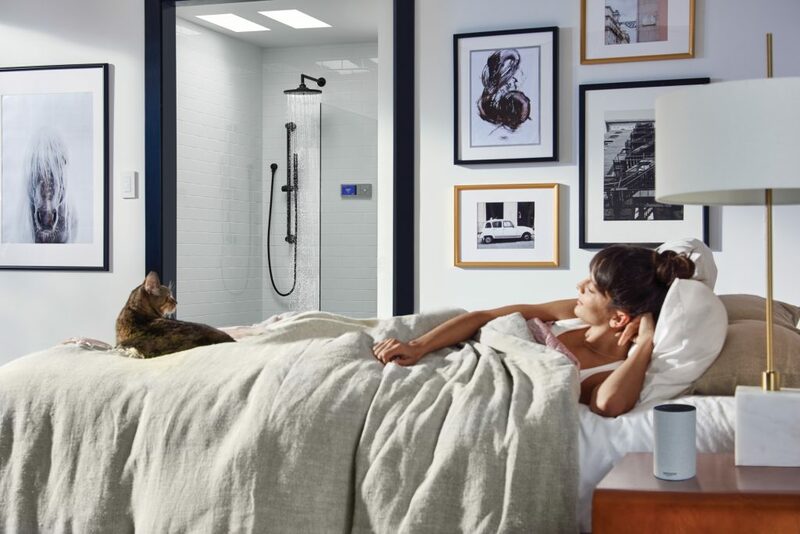 Kohler is on the forefront of connected technology, able to control virtually everything in the bathroom with voice activation through Alexa. Users fine-tune every aspect to their exact preferences from the shower to ambient colored lighting, wireless Bluetooth music, heated toilet seat and foot warmer, etc. 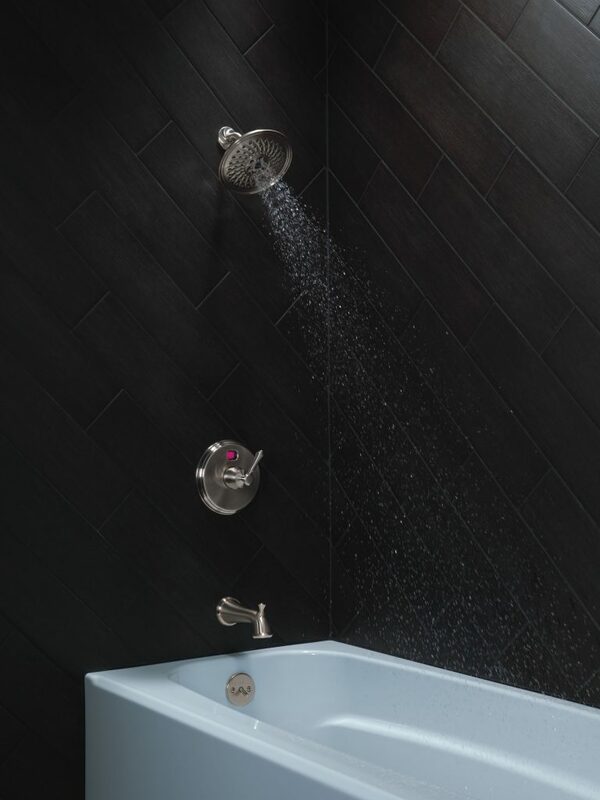 The Kohler DTV+ shower system is just one of many Kohler Konnect products. 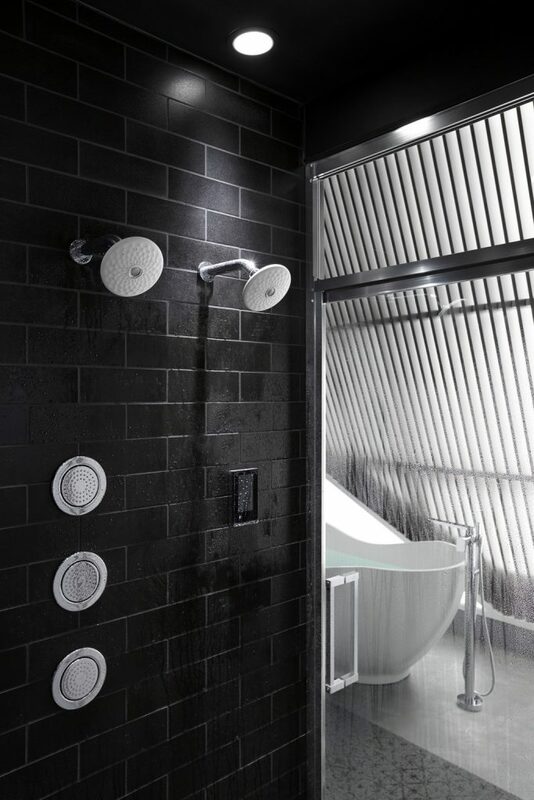 The DTV+ showering system allows the user to control water, steam, music and lights and create pre-sets to customize the shower to their needs. The Numi toilet delivers hands-free control and personalized cleansing functionality. These features can be controlled through motion-control, app control or voice control. Kohler’s PureWarmth heated toilet seat includes an integrated nightlight and the heat and lighting levels can be controlled through an app with pre-sets. The company’s Touchless Response Toilet features a standard trip lever with a motion sensor embedded to provide users the convenience of touchless flushing. The flush proximity sensor and integral nightlight can be adjusted through the Kohler Konnect app. One of the more interesting smart products is Kohler’s Verdera Voice Lighted Mirror with Amazon Alexa. Designed as a centerpiece of the smart bathroom of the future and with the ability to pair other Kohler Konnect products directly to the mirror, it improves the comfort and functionality of time spent in the bathroom by enabling it to be hands-free, seamless, and more convenient, while also communicating with other connected products in the Wi-Fi network. It offers customers access to tens of thousands of Alexa skills. Adjusting the voice control on the Kohler Verdera mirror, the nerve centre for the connected bathroom. Other features include a dual-microphone to enhance the accuracy of voice-control, speakers housed in hermetically sealed casings to maximize stereo sound quality, a motion-activated wayfinding nightlight for safety and highly efficient LED lights for makeup application, grooming and skin care. The new Genius shower system from Riobel also uses a digital shower valve. In a digital shower valve, basically a sensor controls a stepper motor that mixes the hot and cold water. “No longer is there a mechanical cartridge; it’s all managed by electronics,” reported David Raymond, engineering and quality control director for Riobel, Saint-Jérôme, Que. No valves! The Riobel Genius shower and its control. The touch-screen control panel for the Riobel Genius system is about the size of a smart phone. “This is the only thing you are going to have on your shower wall. For plumbers, it’s easier to do the plumbing,” said Raymond. There are hot and cold inlets and piping to the shower heads. A single wire connects the control to the digital shower valve. It is a 110-volt system with a transformer, so it will require the installation of a GFCI (ground fault circuit interrupter) plug. Touch2O technology from Delta Faucet and SmartTouch technology from Brizo basically turn the entire faucet into a sensor, so that the user can activate it by touching anywhere, reported Stan Speerstra, vice president, product development and product management for Masco Canada. There are also touch or hands-free electronic soap dispensers. The Temp2O shower head, hand shower or shower valve offer colour and digital display of water temperature. The Delta Temp2O shower system features digital control. Manufacturers have gone to considerable lengths to ensure that installing and servicing electronic bath equipment is not difficult. “It sounds like it’s going to be complicated, but it’s not,” noted Scott. Moen worked with plumbers during the design stage to ensure it was easy to install, he added. Much of the equipment goes behind the wall, so the U by Moen shower would typically be installed during new construction or a major renovation. 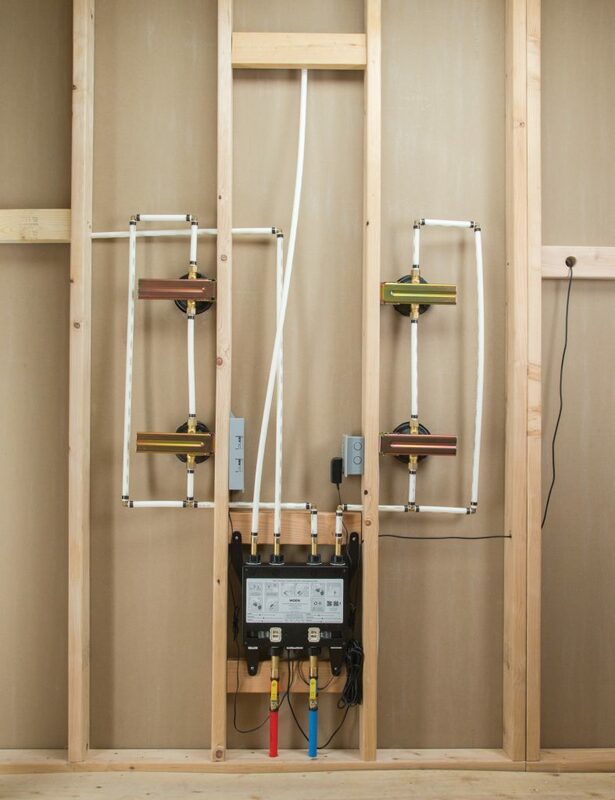 “One of the things that saves time dramatically is you don’t have to install the typical valves you would in a traditional shower.” Everything is located in one master control box with an access panel. “We believe it takes no more time or complexity to install this system than it would a regular shower and it may even be a little faster,” he added. Kohler Konnect products install in the same way as analog products, but they will require power. “The nuance will be the set-up process where the product will be connected to the Kohler Konnect app. The app was designed to be highly intuitive, intended for the homeowner to set up the product since it will be completed on their smart phone,” reported Allis. “However, the plumber will want to ensure the set-up is complete and the product functions as intended,” she added. Often the homeowner would try to work through the problem with the manufacturer on a 1-800 number prior to calling the plumber, reported Scott. They can also download software updates through Wi-Fi. One advantage of these systems is there is fewer parts, he added, basically just a control hooked to a digital valve with a wire, so the plumber would determine which of those is causing a problem and repair/replace as needed. However, like so many things these days, the appeal of these products will depend on how tech savvy the customer is. “There is a certain level of aptitude the homeowner should have with electronics to fully realize the benefits,” noted Allis.